Willie — Thin-sliced pepperoni and ham topped with lettuce, tomato, onion, banana peppers, Italian dressing & your choice of cheese. Served on a hoagie roll. Reuben — Thin-sliced corned beef piled high on marble rye with sauerkraut, Swiss cheese and thousand island. Pulled Pork — Slow-cooked BBQ puled pork topped with homemade cole slaw. Served on a hoagie roll. Fish — Freshly breaded Alaskan Pollock with shredded lettuce. Served on our hoagie roll. 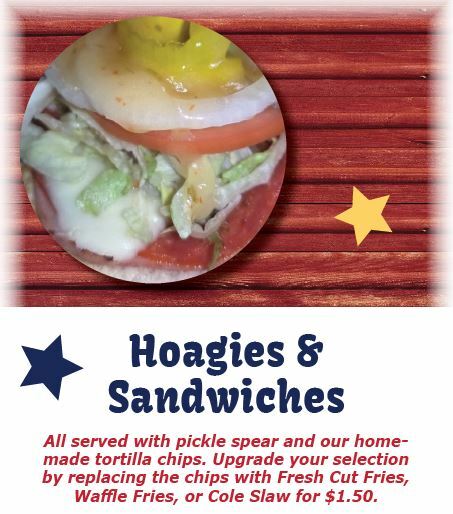 Chicken Hoagie — Choice of grilled or crispy chicken topped with lettuce and tomatoes on our rustic hoagie roll. Try one of our Signature Upgrades for an additional $2: Chicken Bacon Ranch with crumbled bacon and buttermilk ranch; Kansas City Style with Sweet Baby Rays BBQ and onions; Buffalo Style with either ranch or bleu cheese dressing. Cheesesteak — A generous portion of thin sliced steak grilled with onions, mushrooms, and green peppers and your choice of cheese. Served on our hoagie roll. Tuna Melt Sandwich — Albacore tuna salad with celery and onions lightly grilled on our flat top, topped with fresh tomatoes and choice of cheese in between toasted marble rye bread.